The Strike King Tour Grade Tube Jig Head is perfectly made for tube baits and even useful is some hollow bodied swimbaits. 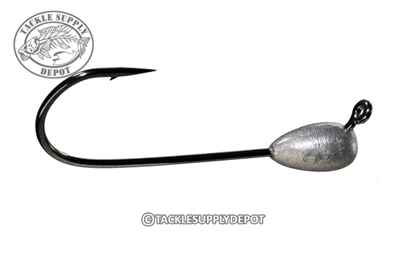 Featuring a weight forward tapered design with a Flat eye 60-degree black nickel Gamakatsu round bend hook which sits ideally in size tube baits resulting in erratic falls and great hookups. If fishing any waters with Smallmouth Bass the tube n jig rig is a deadly lure for combing sandy and rocky bottoms. Also very effective for hungry Largemouth looking for an easy meal. Pair your favorite tube baits with the Strike King Tour Grade Tube Jig Heads.